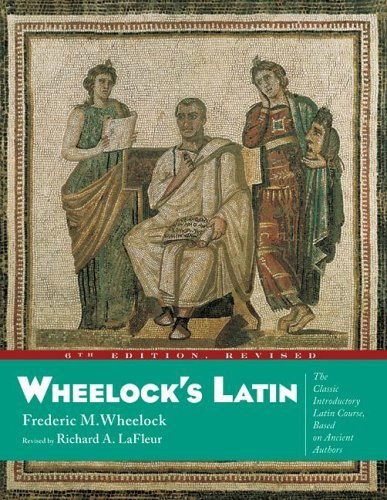 The publication of the second edition of Wheelock's Latin Reader, by editor Richard A. LaFleur, completes a trilogy of Wheelock revisions--Wheelock's Latin, sixth edition (New York NY: HarperCollins, 2000), and Workbook for Wheelock's Latin, third edition, revised by Paul T. Comeau and Richard A. LaFleur (New York NY: HarperCollins, 2000), were recently reviewed by Betty Rose Nagle in CO 79 (2002): 87-88. The changes are few but significant for the classroom teacher and the student. The format of the notes is changed. They now face the text in expanded form and the vocabulary glossing is regularized. There are no macrons in the text or facing vocabulary, but in the full vocabulary at the end of the book macrons are marked and almost every word in the text is defined. Those words that occur five times or more are indicated, so that students may memorize them. Likewise, introductory and background information has been removed from the back of the book, expanded, and placed before each author's selections. One weakness, however, is the bibliography. Although updated and keyed to the authors, there might have been fewer book citations from the 1960s in favor of mention of some text-specific articles or even web links, e.g., for the Pliny letter to Trajan on the Christians see Stephen Benko, "Pagan Criticism of Christianity during the First Two Centuries," ANRW 23.2: 1054-118. But this may have more to do with teacher preparation than student accessibility. All geographic references are now included in the notes and keyed to one of several maps included in the new edition (from the Ancient World Mapping Center). Also new to the second edition are photographs of ancient buildings, antiquities, and paintings on classical themes. For example, among the Verrine selections there are a map of Sicily and 12 photos: several Greek temples and theaters in Sicily, a few sculptures or mosaics from antiquity, and a couple of nineteenth-century paintings romantically depicting the ruins or a related classical theme. These break up and complement the text and provide students with illustrations of the works described as well as a clear sense of geographic location. This revised volume is unique among Latin readers in that it can be used with success following any elementary Latin text. Since it is also not tied to any methodology, students trained in the inductive methods and texts, e.g., Oxford Latin Course, Ecce Romani, or Cambridge Latin Course, as well as students who have learned their basic Latin in Wheelock or some other grammar-translation methods (for a discussion of texts and methods, see J.L. Sebesta, "Aliquid Semper Novi: New Challenges, New Approaches," in R. LaFleur, ed., Latin for the 21st Century: From Concept to Classroom, Glenview IL: Scott Foresman - Addison Wesley, 1998, pp. 15-24), e.g., Latin via Ovid or Traditio, can move successfully into this reader and find interesting and varied selections of accessible length with useful notes. Finally, what makes this reader outstanding is the wide selection of readings. Classical, post-classical, patristic/late antique, and medieval selections (ca. 3,400 lines spanning some 1,400 years) introduce students early on to the breadth and wealth of Latin literature. Unlike many, indeed most, other readers which are adapted texts with idiosyncratic grammar and vocabulary keyed to earlier books in its series, these selections are not keyed to any basic text. They are unadapted and authentic, but note should be taken that passages and even single words are omitted with no indication of that in the text. The Cicero readings comprise almost half of the volume. There are extensive excerpts from the Verrine Orations, selections from the De Officiis and the De Amicitia, and several letters, which may be compared usefully to Pliny's select letters, which include the description of Mt. Vesuvius and the exchange between him and Trajan about the Christians. Livy's legends of early Rome and Ovid's Metamorphoses selections form excellent introductions to Roman historiography and Latin poetry respectively. The selections from Jerome's Vulgate and from the Middle Ages illustrate linguistic and literary transformations from the fifth through the fourteenth centuries. This is a perfect way to move from the study of grammar to reading authentic Latin literature. This standard text for introductory Latin has been praised for its thoroughness, organization and conciseness. This edition includes maps, photos and more. You will find in this essential companion to Wheelock's Latin transformation drills, word power sections, reading comprehension questions and more. This best-selling Latin mini-dictionary comes with a verbs and nouns supplement; numbers, dates and measures; plus an index of geographical names. This is a Latin dictionary and grammar—two books in one. It also has supplements on Roman history, life and culture; words and phrases used in English; and more.